Memory declines for most of us as we get older, but not so for the “super agers” — longevity champs over 80 who have the memory performance of people in their 50s and 60s. 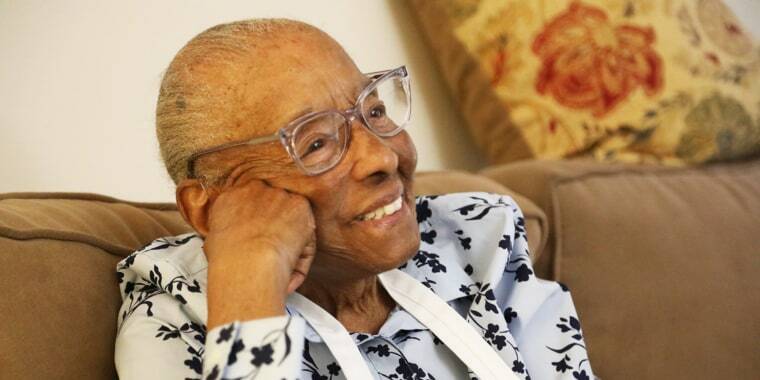 Edith Renfrow Smith is a 104-year-old member of the age-defying, elite group. Born the same year World War I broke out, Smith has lived through 18 U.S. presidents, and still remembers the first time she heard a radio and the day she met Amelia Earhart. She’s worked as a stenographer, telephone operator and a teacher. Throughout her long life, Smith has taken great care of herself, stayed physically active, kept her mind engaged and made friends. She’s never struggled with her memory. Even now, when Smith bakes cookies, nothing is written down because the recipe is all in her head. She was still driving a year ago, only stopping because of hand strength, not weaker cognitive ability. When NBC News special anchor Maria Shriver asked her how it feels to be 104, Smith was quick to respond. Researchers want to know more about her incredible brain power. “These are individuals who are living long and living well. And then the question is: How did they do this?” said Emily Rogalski, an associate professor of psychiatry and behavioral sciences at the Northwestern University Feinberg School of Medicine in Chicago. To unlock the mystery, Rogalski and other researchers are leading the “SuperAging” study, following people with remarkably resilient memory, like Smith. They study their psychology, attitude and other factors to see what they have in common. To be invited in, you can’t just be old — you must pass a memory test. Participants are shown a list of 15 unrelated words and have to remember at least nine of them. To make it even harder, researchers give them a “distracter list” in between, then pause for a break, and then ask them about the first list again. Some of the super agers can remember all 15 words, which is even more impressive, Rogalski said. When the study participants die, they’ll give “the ultimate gift,” with each agreeing to donate his or her brain to science. It’s one of the key parts of this study, Rogalski said. For now, imaging is helping to peek inside their bodies. When a typical 80-year-old’s head is scanned, red and yellow areas represent the thinning in the brain. But there are no such areas in the brains of the super agers. In fact, they have a thicker cortex, a region that’s important for attention — and attention supports memory, Rogalski said. Bottom line: The brains of the super agers seem to be shrinking at a slower rate. Also inside, an abundance of von Economo neurons, once thought to be only inside the brains of elephants and whales. Researchers detected about five times the number of these neurons in a super ager brains compared to average agers. Genes may play a role. But there’s something else Smith and other super agers all have in common: a positive attitude. At 87, Gurolnick describes himself as a “news junkie.” He likes going to the theater with his 80-year-old companion. He’s constantly learning new things and isn’t put off by something new because he believes he’ll figure it out one way or another. Gurolnick is also very physically active. He took up high-impact aerobics in his 60s, though he doesn’t take part in those classes anymore. But he still rides a bike, plays tennis, enjoys water polo and water volleyball, and regularly walks. He said he doesn’t do anything in particular to keep his brain sharp. But all of the super agers seem engaged in life, staying in touch with people, developing deep friendships, and keeping active and busy, Rogalski noted. They also seem to be resilient to stress — not allowing setbacks to keep them from moving forward. Every day is a full day to fill up, Gurolnick noted. They both hope their donated brains will provide lots of clues after they’re gone. “If it helps somebody, think how much that would… mean,” Smith said. “As long as they don't come for it too early,” Gurolnick joked.